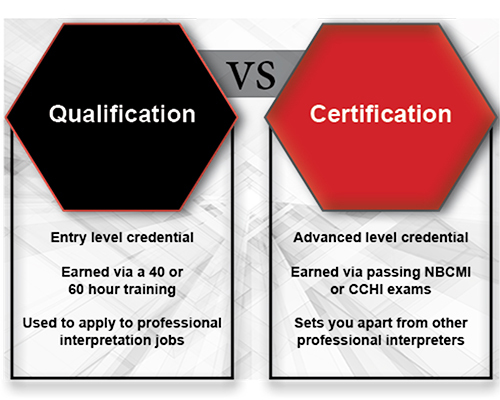 There is universal confusion about the difference between the word “certified” and the word “qualified”. 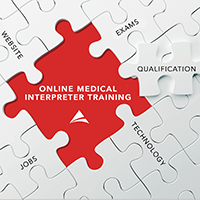 When you sign up for a 40-hour medical interpreter training course, think of it as an entry level credential for interpreters. Graduating from a 40-hour training course will qualify you to work professionally as a medical interpreter. If you want to be “certified”, you will need to take national exams. Those exams are administered by either CCHI or NBCMI. The first step toward working as an interpreter AND earning national certification status is taking a 40 (or 60) hour course. So, if you see a company advertise their 40 or 60 hour course as a program that will certify you, that is incorrect. Those programs will qualify you to interpret professionally, but not grant you national certification status. These days, everything we do is online, and it’s likely that you did most of your preliminary interpreter education research from a simple google search. It may sound a bit odd, but the look, feel, and structure of a website is a big indicator of course quality. Things you should look out for are: Clear pricing information, updated dates and announcements, and overall clarity. In a nutshell: When it comes to an interpreter training course, you actually do want to judge a book by its cover. When you’re shopping around, it’s crucial to understand how you will be tested. Make sure you choose a program that has not only a written final exam, but also an oral evaluation. It’s also important to ask how the evaluations were developed, by whom, and how to know that your scores are legitimate. When it comes to finding work as an interpreter, you can bet that your future employer will care about validity. Steer clear of any program that does not have a legitimate set of final evaluations. The price might be cheap, but you’ll pay later. Ever wondered why you can more easily recall the spelling of a complex word if you write it down while learning it? Have you recently tried to remember your computer password, and had to “air type” the motion with your fingers so that you could recall the numbers and letters? These are examples of learning styles, and the main four categories are: Visual, auditory, reading/writing and kinesthetic. Recognizing your learning style is important when you shop for an online course. At ALTA Language Services, we incorporate multiple layers of learning styles in our lessons. For example, one lesson might prompt you to play a game to memorize new terminology, then apply that terminology with verbal practice. “Online” is a vague term. When you’re shopping around, get clear on exactly what “online” means. Are the lessons on demand? And if so, what exactly do they look like? Is there actual interaction with your screen, or is there only audio? Do you have to do your lessons on certain dates and at specific times, or is self-paced, on your own time? For example, ALTA’s course is self-paced, but we have live (optional) video chat sessions with a trainer twice a week. We merge both online and live components and it’s at your own pace. You may think this is obvious, but if you plan to take a class online, it’s important to make sure you have not only access to internet, but a working and updated device. Your old laptop from 2007 may hold some sentimental value, but it might not be the best device to use for your education. When you are browsing medical interpreter courses, it’s likely you are going to call around. Start paying attention to how easy it is to get in touch with a representative. In general, is it easy to speak to someone? And, if you leave a voicemail, does someone call you back? As a student, it’s important to select a program that will be there to answer your questions and listen to your concerns. You’ll want to know that you can get the help you need, when you need it. I don’t think I have ordered anything online in the last few years without verifying a 4+ star rating. So when it comes to investing in a medical interpreter training course, I’d be sure to add reviews to your vetting process. Google and Facebook are good places to start. Another place you can look is glassdoor.com. These kinds of websites show reviews of what people say it’s like to work at certain companies. That may also be a good indicator of overall training quality. When you are researching where to get your education, everything (from the top to the very bottom) matters. In some cases, a higher price tag can be an indicator of quality, but be careful with this assumption. When it comes to interpreter training, prices are all over the map. You can find online course prices ranging from $450 all the way to $2,000. However, make sure you take steps 1-8, and do your research, instead of choosing based on the price tag. At ALTA, all of our programs are employee-owned, and we take extra pride in delivering premier interpreter training at a fair price. It’s important to invest in a course with a company that cares about the advancement and professionalization of the interpretation community. Select a program that cares about making you the best interpreter that you can be. Choose a company that won’t compromise on quality or validity. Once you’ve gone through the 9 tips listed above, you’ll have a pretty good idea of which companies are focused on the big picture. Marge Curtis is the Executive Director of Interpreter Training at ALTA Language Services. Her passion for language and culture has been the root of her work to further the profession of interpretation, and ensure high quality language access.